What about courage, justice, and self-sacrifice? Podles is interested in very long-term trends, but the problem of men just not coming to church, only got going in recent decades, at least in the English-speaking world, and this process mirrors the secular trends. Men actually outnumbered women in American churches as recently as 1974. What I said about the problem of secular membership organisations in relation to the Church, I want to say again about the withdrawal of men. It is true that all membership organisations went into decline from the 1970s, but a huge woolly hole in the explanation for this is labelled by Robert Putnam, in his classic book on the subject Bowling Alone, as 'values': the change of values over time, and from one generation to the next. 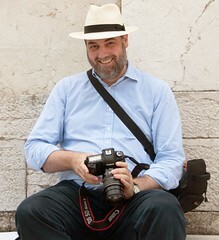 The Catholic Church and the mainline Protestant churches chose precisely this moment of conflict about values to announce that they were no longer going to resist the values of the world; no, they were going to do their best to embrace them, to see the good in them, and to give up trying to make their communities visibly different from everyone else. At the moment of crisis, at the moment at which the Catholic Church was perhaps the only institution with the cultural weight to make a difference, instead of a battening down of the hatches, there was a collective letting go. It is understandable; they were under pressure. If they had stood firm they would have lost a proportion of people determined to enjoy modernity to the full. But the Church as a culturally and socially visible institution would, at least, have survived. As things have worked out, this does not look like happening. Liberals will tell you that if the Church had dug in, in the 1960s, it would have collapsed even more rapidly. We can't stop them deluding themselves, but those of us who live in the real world must ask what has happened to groups who bucked the trend at least to an extent, such as the Mormons, and what kind of religious groups have experienced strong growth since the 1960s: Orthodox Jews, Muslims, Hindus, Pentecostalists... Easy-going, liberals religious groups have collapsed, demanding, conservative groups have thrived. The latter even use sacred, non-cradle languages in their liturgy! (Especially the Pentecostalists.) Could there be a lesson here? But leaving that aside, the 'man crisis' is in fact an aspect of the transformation of values Putnam refers to. Since the 1960s men have progressively stopped being respected and rewarded for their traditional role, a role which demanded a huge amount of self-discipline and self-sacrifice from boyhood onwards, and are therefore slowly withdrawing from that role, and from the self-discipline and self-sacrifice it required. (I don't just mean hard work: actually fighting, saving people from burning buildings, and getting killed, is also part of the package for many men.) They aren't being selfish or childish, they are simply responding to incentives, like rational agents. The attack on traditional gender roles also put huge pressure on the Church's teaching on sexual complementarity. The major Protestant denominations have thrown in the towel, and the more liberal American ones are now demonstrating what happens next: total obliteration. The Catholic Church has held the line on female ordination, but in an attempt to ease the pressure has given a series of other concessions, female Altar servers being an obvious example. We have the Holy Ghost to thank for the Church's solidity on ordination. But the Church has not been a bastion of opposition to the attack on traditional gender roles, despite the fact that important aspects of them are embedded in her teaching. 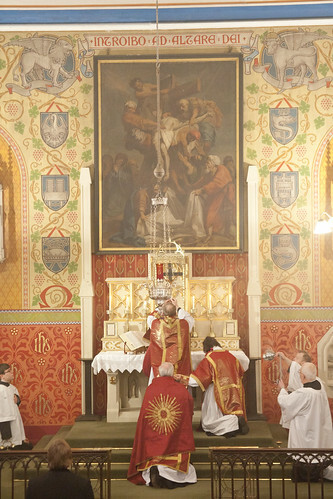 It has not resisted, in the liturgy, the kind of feminisation which has taken place in the secular world: on the contrary, in many ways it has gone much further. Finally, and as Podles notes, one almost never hears anything positive about fatherhood or masculinity from the pulpit. Men have, accordingly, absented themselves from an environment in which they do not feel comfortable, even as more and more emphasis is placed on the importance of 'reaching out to women'. To summarise, the kind of serious, hard-working, bread-winning, responsible men who were once the backbone of Catholic congregations, and who once filled Catholic seminaries, have been worn down by the transformation of values and no longer exist in the numbers they once did. The Church is not responsible for this, but on the other hand the Church has done very little to oppose it. On the contrary, the Church's liturgy and parochial structures have been feminised to such an extent that, instead of being any kind of refuge for men, the Church can often seem a particularly unfriendly environment for them. As responsible men become a scarce commodity, the Church has sent the signal that they are not welcome. Please note I've not said whether this is a good or a bad thing, just that it has happened. I hope feminists would agree with the historical analysis, and I would expect them to say that any costs were worth paying to overthrow a situation which was inherently patriarchal. Bear in mind that men who drop out of the traditional, hard-working, responsible regime are not necessarily unhappy. The unhappy ones are the ones who work hard and are then kicked in the teeth for it: who find they are despised, treated as potential child-abusers, and victimised by the family courts. They are, on a much larger scale, like the men who insist on holding doors open and vacating seats for women and who get ticked off by feminists, who say 'I'm quite capable of doing it myself thank you'. That kind of chivalrous behaviour only makes sense if there is some kind of social payoff, in gratitude and respect. If you keep getting (metaphorically) slapped in the face for doing it, the behaviour is quickly rooted out: which is what feminists want. The perpetual teenager-types, by contrast, can make themselves materially comfortable with an undemanding job, or for that matter on benefits, on the basis that they aren't going to get married and support children, and they are in no way excluded from casual relationships with women. They may not be fulfilling their true selves as Catholics would see it, but superficially they are fine. It is women, who tend to want children, who really get the short end of the stick in the new situation. As the trend continues, they are increasingly having to raise these children on their own. And for all the bravado, that is a tough option. Feminists reading this may be wondering if, in my view, the Church needs to be misogynistic in order to attract men. That isn't my view, but then I don't think the Church was misogynistic when, in the recent past, it did attract men. There were problems with a popular, sentimental and asexual ideal of femininity (and ideal of masculinity), as I noted above, but that was not part of what attracted men to the Church in the old days, on my and Podles' view. 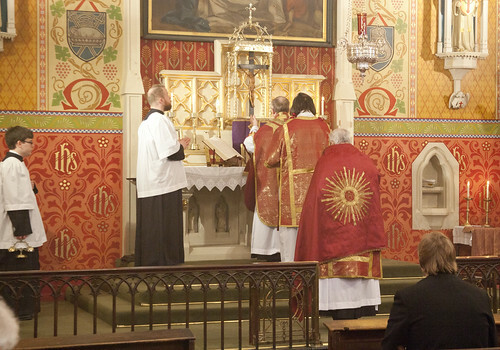 What is needed now, to make the Church a comfortable place for men to be, is not misogyny, but liturgy with some degree of seriousness - which is why you find plenty of men at the Traditional Mass - a preaching which allows the masculine virtues their place in the spiritual life, and, ideally, an end to the amnesia about sexual complementary. Readers will be familiar with the saying: The squeaking gate gets the oil. The people who complain, who organise themselves, who set up support groups and write letters, they get attention, and they have the best chance of getting what they want. That is part of the explanation of the success within the Church, as in society as a whole, of busybodies of all kinds. This simple observation shows up a particular problem for men in the Church and in society. What we have is a group of people who prefer not to show their emotions, and intensely dislike talking about them. They don't seek each other's company to share problems, and they tend not to be as articulate as others. Lest you think I am describing morons, let me add that they express themselves, but do so more through actions, than words. Their characteristic virtues include endurance, fortitude, and industry. They are attracted by the ideal of quiet self-sacrifice. They regard one of their kind, who is always banging on about his problems, as a bit of a weed. They regard one of their kind, who is always talking about his virtues, as a bragging fool. Men are so much less inclined to visit their GP with mild ailments, that they die disproportionately from treatable diseases. Dr Helen Smith asks: when was the last time you heard of a support group for men? She thinks men should organise themselves more, in order to demand reforms to child support rules and the like. (Of course, such groups exist, but they are minuscule compared to the 'womens' advocacy' industry.) Various people have suggested, by parallel, a 'men's movement' in the Church, with men's groups and men's spirituality. But most men would rather just slope off to somewhere where they feel comfortable. Maybe the garden shed. But the Apostles were sent to them too. For a slightly dyspeptic look at the decreasing attractiveness of marriage, see the Evangelical blogger Dalrock. Apologies for being slightly off-topic, but I had a point about men and the liturgy that I didn't have a chance to make when the more relevant posts were still current. People who are not churchgoers find that Christianity has a high cringe factor. All the talk of love, joy, peace, forgiveness and fluffy bunnies that comes up in a Christian setting is downright embarrassing to most non-churchgoers, and is one of the things that stops people considering Christianity as a serious option. Converts (and I'm a recent male convert myself) can find that cringe factor to be a real obstacle, and if the cringe-inducing material is emphasised too strongly it can be thoroughly off-putting. What I've found from going to the TLM Is that having Mass in Latin eliminates that problem, at least as far as the liturgy goes. I still know from my missal what the priest is saying, but putting the prayers behind a semi-permeable language barrier neutralises their potential to be embarrassing, and allows me to focus on their content undistracted by my instinctive yuck-reaction. The fact that Latin is such an elegant, concise, serious-sounding language does of course help enormously. You'll find the content of the prayers different as well. The elimination of 'negative' theological elements in the Reform, like sin, penance, and grace, the rejection of worldly things and the intercession of the Saints, gives the two Forms a quite different feel. I left seminary a few years ago after quite a raucous time. Having laid aside a promising management career, I felt very betrayed by the likes of Cardinal O'Brien's and Pope Benedict's resignation, quoting Dante on Celestine V on hearing the news. This was also reflected in seminary. Men were treated with contempt and danger. The experience of being screened and then subject to regular "human direction" (this applied to all of us) was invasive and offensive. It was a relief to leave all that navel-gazing behind. Perhaps the most disappointing thing was that the once place that was meant to be a refuge from all the demoralising things in the world, the Church, had simply gone along with its tune. In the end, I too gave up on that natural masculine drive in favour of an easy life in which I could pursue my own interests in peace. I wish it were otherwise, but I do not wish to be a martyr to ancient, unrewarded virtues.